Grodan Stonewool (rockwool) is made from molten rock spun into cotton candy-like fibers and then compressed into cubes, blocks, or slabs. Where other rockwool brand manufacturers cut all sizes from one batch of wool, Grodan is unique by making different types of fibers. The purpose is to support the requirement of the plant in the different plant stages. Grodan has a tremendous capacity for absorbing nutrient solution while retaining plenty of oxygen for rapid plant growth. Grodan comes in graduated sizes. Seedlings started in cubes are easily transferred to blocks and then onto slabs, if desired. Seedlings or cuttings started in the Grodan cubes can also be transplanted into more traditional planters and growing mediums. Grodan A-OK plugs are designed for seed and cutting propagation prior to "blocking on" into larger growing blocks. The V-shape design of the plug discourages tangling of roots between the plugs in the A-OK plug sheet. A-OK plugs come in a sheet that fits a standard 10x20 flat. 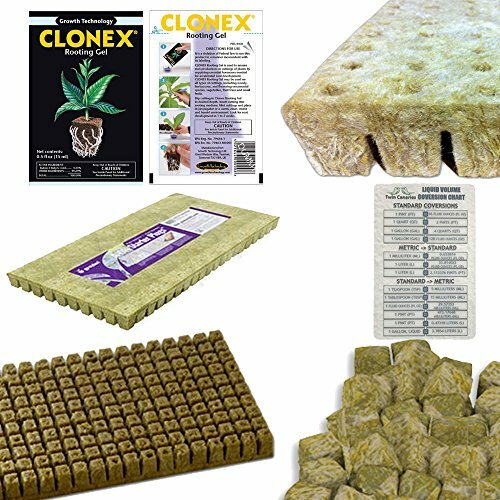 Clonex® Rooting Gel is a high performance, water-based, rooting compound developed by Growth TechnologyTM Ltd. It is a tenacious gel which will remain in contact around the stem, sealing the cut tissue and supplying the hormones needed to promote root cell development and vitamins to protect the delicate new root tissue. Clonex® is EPA registered and approved for use on all plants, including food crops. Grodan A-Ok Rockwool Starter Plugs, 15mL Satchel of Clonex Rooting Compound. A-Ok starter plugs are used prior to plugging into the larger Grodan Gro-Blocks. Clonex Rooting Compound is a thick gel which will remain in contact around the stem, sealing the cut tissue and supplying hormones needed to promote root cell development and vitamins to promote new root tissue. Clonex Rooting Compound has a full spectrum of primary nutrients and trace elements to nourish the young roots plus anti-microbial agents to protect against fungal contamination.